Yesterday’s signals were not triggered, as there was no bearish price action at 1.3295. Trades may only be taken until 5pm New York time today. Long entry after the next bullish price action rejection following the next touch of 1.3250 or 1.3208. Short entry after the next bearish price action rejection following the next touch of 1.3332 or 1.3367. I wrote yesterday that the longer the price stayed below 1.3300 the less bullish the picture would become, but I still saw the odds as with the bulls but probably with little movement. This was a fair call as the price did rise higher but could not stay there. Now I don’t see any resistance as reliable until 1.3332. 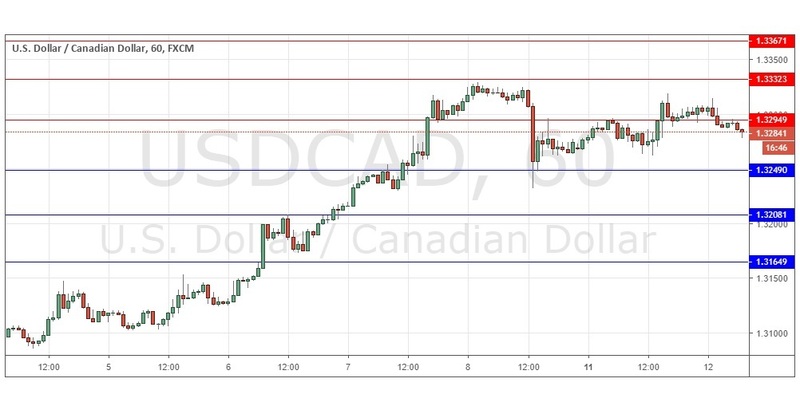 There is no good trend to exploit and most of the key levels do not look particularly strong, so this pair is probably best avoided for the time being – there are likely to be better opportunities today in the major Forex currency pairs. I have no directional bias here. There is nothing of high importance due today regarding the CAD. Concerning the USD, the Chair of the Federal Reserve will be making a minor speech at 5:45pm London time.